Gentlemen readers, unless you are fabulous hair dressers or dads in charge of the morning hair routine (mine was, and boy was he proud when he discovered the flip through ponytail! ), this post is probably not for you. Ladies and hair-interested men, listen up. I discovered my secret to summer hair. It only took me 28 years, (which is okay, because it took me 26 years to learn how to wear makeup). I have never been high maintenance with my hair and have always envied girls that make looking put together seem effortless. That’s the beauty of this discovery– it is almost effortless. All you need is wet hair and the ability to start a french braid, (even if that ability stops as soon as those first three strands are started, which it does in my case). 1. Start one french braid at the crown of the head to one side or your part, (the part does not need to be in the center, in fact I think it’s cuter if one side ends up with more play). 2. Instead of continuing a french braid all of the way down, just use those first three braid pieces to make a regular braid down the back of the head, (you’ll end up with one small braid). Rubber band at the end for now. 3. 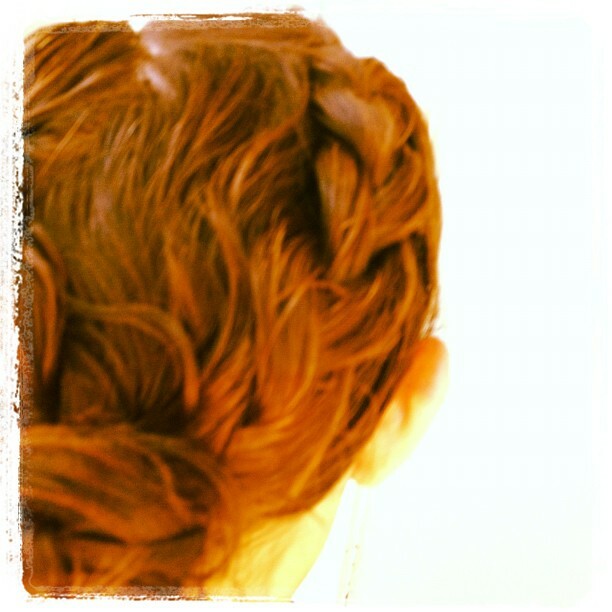 Do the the same thing to the other side, creating a second small braid to the other side of your part. You should still have about half of your hair left unbraided since you did not continue french braids all the way down. 4. Remove rubber bands from the braids and combine with the remaining hair to twist into one bun, (today I varied this by braiding the two small braids with the remaining hair into one long braid before twisting into the bun, either works well). 5. Ta-da! Your hair is now summer ready, (great for swimming, or still looking pulled together without having to blow dry). BONUS: After your hair dries, you have a second wavy look for later, (which I’m noticing is really in right now). 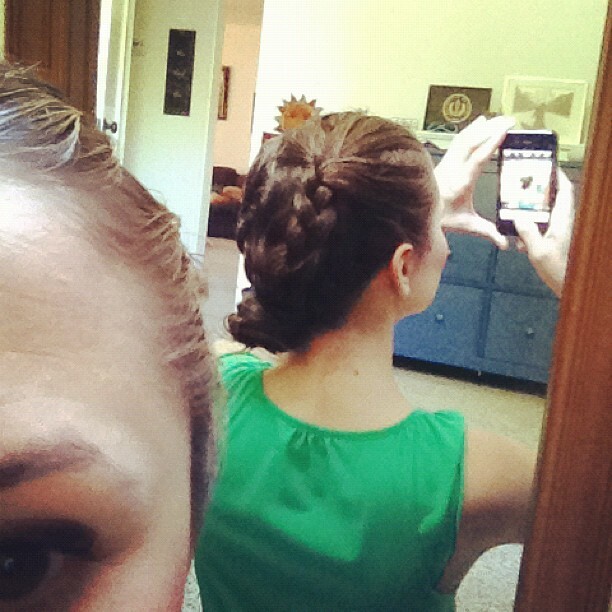 The braids create a relaxed but pretty summer look that is really hard to mess up, (if I can do it, you can do it!). Reminds me a little of the coveted renaissance fair braids growing up, very sweet and romantic. 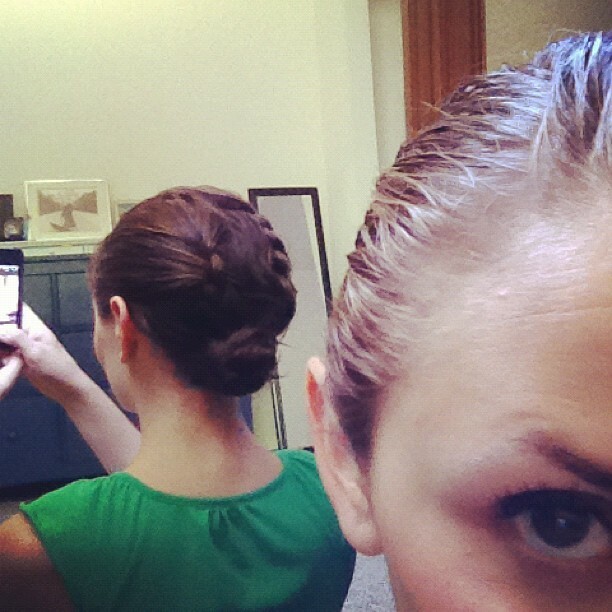 I love that this is something I can actually successfully do to my own hair in five minutes. Had to include this shot for my creepy evil eye. Cute!!! Can’t wait to try it!